1. Walk through your house and see how many of the following foods are found. 2. Tally up all your findings. 3. See how you stack up! Don’t see a food that frequents your pantry? Send us your findings and we’ll add it to the list! Pop the lid, fill water to the line, microwave for a couple of minutes and you have a cheesy delicious pasta meal fit for a king. Or a college kid running late to class. Either way, it’s good, and it’s probably served in your house. Do you have this in your house? Ah, the Poptart. Have you ever met someone who doesn’t love a Poptart? It’s sugar stuffed inside bread topped with icing- what’s not to love? Dry and straight out of the box or in a cup to-go with milk, cereal is a college way of life. The simplest form of sustenance for college kids of all ages. All hail cereal! There is no shame in the Slim Jim game. If you enter a fraternity house, you will find these protein packed treats around every corner. This is about as home-cooked as you will find a meal in a fraternity house. You have to open the can, maybe rinse the beans (if you’re getting real fancy), and then put them in a pot…on the actual stove. You’re practically Chef Gordon for 50 cents a can. Luckily, it’s not all fend-for-yourself out there. Most fraternities have an in-house chef to help prepare you three gourmet meals a day. I’ll bet we can guess what’s on the menu. Chicken comes in many shapes and form and is constantly found on the menu. Chicken nuggets, strips, fried, baked. You name it, and it’s served in Greek houses around the country. Spaghetti has got it all. Carbs, meat, sauce, and it’s slurpy. Food and fun all rolled into one! Chances are, this is on chef’s menu at least once a month for dinner. As if hot dogs weren’t perfect enough in their original state, someone brilliantly dipped them in cornbread batter and fried them. Plus- they’re on a stick, so grab and go. Win-win-win! 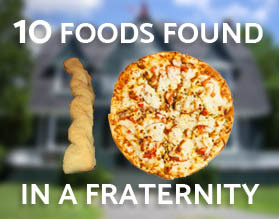 One simply can’t live in a fraternity house without pizza grazing the menu a few times. It’s basically a portable balanced meal in one delicious triangular slice of heaven, ready to go when you are! This might be a rare menu staple but what would a house full of men be without a steak every now and then? What are you guys eating? Comment below to tell us what is found in your pantry! Congratulations- you are totally average! You, along with the rest of the Greek system, are chowin’ on the same grub! Wanna save some money on the food your fraternity is currently purchasing? Read about how CCPA can partner with your house-chef to save on great food!